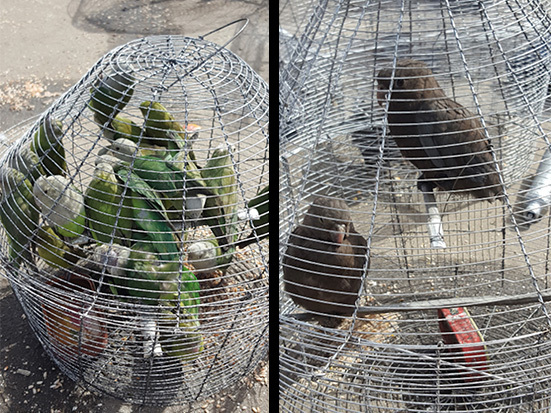 The live capture of parrots is causing increasing concern across Africa. In Madagascar, home to three species of parrot (Coracopsis nigra, C. vasa, Agapornis canus), no study has examined how these species are being extracted from the wild and traded. In this study, we examined the procurement, length of ownership, and the end of ownership of pet parrots. Data were collected via household surveys (n = 440 interviews in 9 towns), market visits (n=17 markets in 6 towns), and opportunistic data collection methods in urban, Malagasy towns. Most Coracopsis spp. are purchased (59%) or captured directly by the owner from the wild (22%), although we were unable to determine how A. canus was procured. Survey respondents reported purchasing Coracopsis spp. for the price of USD 5.36 ± 3.20. The average Coracopsis spp. was kept in captivity for 3.17 ± 2.51 years. No survey respondents provided information on the purchase price or length of ownership for A. canus. Ownership ended primarily when Coracopsis spp. escaped/flew away (36%) or died of unknown causes (21%). A. canus also flew away, although this was only reported in one instance. In-country demand appears to be met by a trade network of both informal and formal actors. It is unclear whether current protections for Madagascar’s parrots, as far as the domestic market is concerned, are sufficient to ensure sustainable extraction of live individuals. La capture de perroquets vivants est une préoccupation grandissante en Afrique. À Madagascar, qui abrite trois espèces de perroquets (Coracopsis nigra, C. vasa, Agapornis canus), aucune étude n’a examiné la manière dont ces espèces sont extraites de la nature et vendues et achetées. Dans cette étude, nous avons examiné l’acquisition, la durée de possession, et la fin de possession des perroquets domestiques. Les données ont été collectées grâce à des études dans les ménages (n=440 enquêtes dans 9d villes), des visites dans les marchés (n=17 marchés dans 6 villes), et à une collecte de données opportunistes dans des zones urbaines malgaches. La plupart des Coracopsis sont achetés (59%) ou extraites directement de la nature par les propriétaires (22%) ; il nous a été impossible de déterminer les moyens utilisés pour l’obtention d’A. canus. Les personnes interrogées ont déclaré l’achat des espèces de Coracopsis pour la somme de 5,36d ± 3,20 dollars US. En moyenne, ces espèces ont été gardées en captivité pendant 3,17 ± 2,51 ans. Aucune personne interrogée n’a procuré d’information sur le prix d’achat ou la durée de possession pour A. canus. Pour les espèces de Coracopsis, la possession s’est principalement terminée lors de la fuite/l’envol (36%) ou la mort liée à des causes inconnues (21%). La fuite d’A. canus a également été déclarée, mais dans un cas seulement. La demande locale semble être satisfaite par un réseau commercial d’acteurs formels et informels. Il n’est cependant pas encore clair si la protection des perroquets de Madagascar, permet que l’extraction de ces espèces pour le marché domestique soit menée de façon durable. Andreone, F., Cadle, J. E., Cox, N., Glaw, F., Nussbaum, R. A., et al. 2005. Species review of amphibian extinction risks in Madagascar: conclusions from the Global Amphibian Assessment. Conservation Biology 19, 6: 1790–1802. Annorbah, N. N. D., Collar, N. J. and Marsden, S. J. 2016. Trade and habitat change virtually eliminate the grey parrot Psittacus erithacus from Ghana. Ibis 158, 1: 82–91. Beissinger, S. R. and Bucher, E. H. 1992. Can parrots be conserved through sustainable harvesting? BioScience 42, 3: 164–173. Bennett, E. L. 2002. Is there a link between wild meat and food security? Conservation Biology 16, 3: 590–592. BirdLife International. 2016a. Coracopsis vasa. The IUCN Red List of Threatened Species 2016: e.T22685261A93065700 downloaded 21 January 2017. BirdLife International. 2016b. Coracopsis nigra. The IUCN Red List of Threatened Species 2016: e.T22727885A94964612. downloaded 21 January 2017. BirdLife International. 2016c. Agapornis canus. The IUCN Red List of Threatened Species 2016: e.T22685326A93068058. downloaded 21 January 2017. BirdLife International. 2017a. Species factsheet: Agapornis canus. downloaded 21 January 2017. BirdLife International. 2017. Species factsheet: Coracopsis vasa. downloaded 21 January 2017. Bollen, A. and van Elsacker, L. 2004. The feeding ecology of the lesser Vasa Parrot, Coracopsis nigra, in south-eastern Madagascar. Ostrich 75, 3: 141–146. Bowen-Jones, E., Brown, D. and Robinson, E. J. Z. 2003. Economic commodity or environmental crisis? An interdisciplinary approach to analyzing the bushmeat trade in Central and West Africa. Area 35, 4: 390–402. CITES. 1983. Convention on International Trade in Endangered Species of Wild Fauna and Flora. Paper presented at Gaborone. downloaded 5 December 2016. CITES. 2008. Interpretation and Implementation of the Convention. Species Trade and Conservation. Review of Significant Trade. SC57 Doc29.2. Fifty-seventh meeting of the Standing Committee, Geneva, Switzerland. Dowsett, R. J. 2000. Le statut des Perroquets vasa et noir Coracopsis vasa et C. nigra et de l’inséparable à tête grise Agapornis canus à Madagascar. IUCN Species Survival Commission, Cambridge, UK. Durbin, J. C. 2007. New legislation for the protection of Malagasy species. Lemur News 12: 4–6. Ekstrom, J. M. M. 2004. Psittaciformes: Coracopsis spp., parrots. In: The Natural History of Madagascar. S. M. Goodman and J. P. Benstead (eds. ), pp 1098–1102. The University of Chicago Press, Chicago, USA. Forshaw, J. M. 2010. Parrots of the World. Princeton University Press, Princeton, USA. Gardner, C. J. and Davies, Z. 2014. Rural bushmeat consumption within multiple-use protected areas: qualitative evidence from Southwest Madagascar. Human Ecology 42, 1: 21–34. Golden, C. D. 2009. Bushmeat hunting and use in the Makira Forest, north-eastern Madagascar: a conservation and livelihoods issue. Oryx 43, 3: 386–392. Golden, C.D., Wrangham, R.W. and Brashares, J. S. 2013. Assessing the accuracy of interviewed recall for rare, highly seasonal events: the case of wildlife consumption in Madagascar. Animal Conservation 16, 6: 597–603. Golden, C. D., Bonds, M. H., Brashares, J. S., Rasolofoniaina, B. J. R. and Kremen, C. 2014. Economic valuation of subsistence harvest of wildlife in Madagascar. Conservation Biology 28, 1: 234–243. Grenoble, R. 2013. Ploughshare tortoise smugglers caught with percent of entire species at Thailand airport. downloaded 2 December 2016. Hart, J., Hart, T., Salumu, L., Bernard, A., Abani, R. and Martin, R. 2016. Increasing exploitation of grey parrots in eastern DRC drives population declines. Oryx 50, 1: 16. Hino, T. 2002. Breeding bird community and mixed-species flocking in a deciduous broad-leaved forest in western Madagascar. Ornithological Science 1, 2: 111–116. Jenkins, R. K. B., Keane, A., Rakotoarivelo, A. R., Rakotomboavonjy, V., Randrianandrianina, F. H., et al. 2011. Analysis of patterns of bushmeat consumption reveals extensive exploitation of protected species in Eastern Madagascar. PLoS ONE 6, 12: e27570. Kümpel, N. F., Milner-Gulland, E. J., Cowlishaw, G. and Rowcliffe, J. M. 2010. Incentives for hunting: the role of bushmeat in the household economy in rural Equatorial Guinea. Human Ecology 38, 2: 251–264. Luescher, A. 2006. Manual of Parrot Behavior. Blackwell Publishing, Iowa, USA. Martin, R. O., Perrin, M. R., Boyes, R. S., Abebe, Y. D., Annorbah, N. D., et al. 2014. Research and conservation of the larger parrots of Africa and Madagascar: a review of knowledge gaps and opportunities. Ostrich 85, 3: 205–233. Olah, G., Butchart, S. H. M., Symes, A., Guzman, I. M., Cunningham, R., et al. 2016. Ecological and socio-economic factors affecting extinction risk in parrots. Biodiversity and Conservation 25, 2: 205–223. Pires, S. F. and Clarke, R. V. 2011. Sequential foraging, itinerant fences and parrot poaching in Bolivia. The British Journal of Criminology 51, 2: 314–335. Rakotoarivelo, A. R., Razafimanahaka, J. H., Rabesihanaka, S., Jones, J. P. G. and Jenkins, R. K. B. 2011. Lois et règlements sur la faune sauvage à Madagascar: Progrès accomplis et besoins du future. Madagascar Conservation & Development 6, 1: 37–44. Randrianandrianina, F., Racey, P. A. and Jenkins, R. K. B. 2010. Hunting and consumption of mammals and birds by people in urban areas of western Madagascar. Oryx 44, 3: 411–415. Reuter, K. E. and Schaefer, M. S. 2016. Illegal captive lemurs in Madagascar: comparing the use of online and in-person data collection methods. American Journal of Primatology. Reuter, K. E., Gilles, H., Wills, A. R. and Sewall, B. J. 2016a. Live capture and ownership of lemurs in Madagascar: extent and conservation implications. Oryx 50, 2: 344–354. Reuter, K. E., Randell, H., Wills, A. E., Janvier, T. E., Belalahy, T. R. and Sewall, B. J. 2016b. Capture, movement, trade, and consumption of mammals in Madagascar. PLoS ONE 11, 2: e0150305. Reuter, K. E., Rodriguez, L., Hanitriniaina, S. and Schaefer, M. S. 2017. Ownership of parrots in Madagascar: extent and conservation implications. Oryx. Schwitzer, C., King, T., Robsomanitrandrasana, E., Chamberlan, C. and Rasolofoharivelo, T. 2013. Integrating ex situ and in situ conservation of lemurs. In: Lemurs of Madagascar: A Strategy for their Conservation 2013–2016. C. Schwitzer, R. A. Mittermeier, N. Davies, S. Johnson, J. Ratsimbazafy, J. Razafindramanana, E. E. Louis Jr. and S. Rajaobelina (eds. ), pp 146–152. IUCN SSC Primate Specialist Group, Bristol Conservation and Science Foundation, and Conservation International, Bristol, UK. Sommerville, M., Milner-Gulland, E. J., Rahajaharison, M. and Jones, J. P. G. 2010. Impact of a community-based payment for environmental services intervention on forest use in Menabe, Madagascar. Conservation Biology 24, 6: 1488–1498. Soulsbury, C. D., Iossa, G., Kennell, S. and Harris, S. 2009. The welfare and sustainability of primates kept as pets. Journal of Applied Animal Welfare Science 12, 1: 1–20. Tapley, B., Griffiths, R. and Bride, I. 2011. Dynamics of the trade in reptiles and amphibians within the United Kingdom over a ten-year period. The Herpetological Journal 21, 1: 27–34. Tella, J. L. and Hiraldo, F. 2014. Illegal and legal parrot trade shows a long-term, cross-cultural preference for the most attractive species increasing their risk of extinction. PLoS ONE 9, 9: e107546. UN. 1992. Convention on Biological Diversity. Paper presented at Rio Earth Summit. Rio de Janeiro. downloaded 2 December 2016. UNEP-WCMC. 2016. CITES trade statistics derived from the CITES Trade Database. UNEP World Conservation Monitoring Centre, Cambridge, UK. downloaded 2 December 2016. United Nations Treasury. 2016. UN Operational Rates of Exchange. accessed 2 December 2016. Watson, J. E. M., Whittaker, R. J. and Dawson, T. P. 2004. Habitat structure and proximity to forest edge affect the abundance and distribution of forest-dependent birds in tropical coastal forests of southeastern Madagascar. Biological Conservation 120, 3: 311–327. Young, A. M., Hobson, E. A., Lackey, L. B. and Wright, T. F. 2011. Survival on the ark: life-history trends in captive parrots. Animal Conservation 15, 1: 28–43.